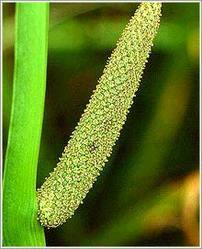 Common Name : Calamus, Sweet-flag, Sweet Root, Bach. Habitat : North temperate and subtropical regions upto 2200m altitude in himalayas. Uses : It is nauseant, stomachic, anthelmentic, stimulants, emetic, expectorant, carminative, antispasmodic and nervine sedative. Rhizome is used in the cure of host of diseases such as epilepsy, mental; ailments, chronic diarrhoea and dysentery. It is used in incense sticks and dhup and is widely used as insecticide for lice, bedbugs, worms etc. It is used internally in the treatment of digestive complaints, bronchitis, sinusitis etc. It is also used externally to treat skin eruptions, rheumatic pains and neuralgia.